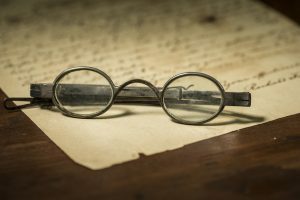 When you were in grade school, you might have learned that Benjamin Franklin invented “bifocals” and assumed that meant “glasses.” While Franklin did indeed invent bifocals in 1779, he did not actually invent glasses themselves – he merely created a version with multiple lenses that could help people with more complicated vision needs. So, if Franklin didn’t invent glasses, who did? As it turns out, we don’t really know! Humans had been magnifying their vision for several thousand years before glasses were ever invented. The early methods of magnification were somewhat crude and imprecise, making use of naturally occurring materials to bend light. Magnification as a scientific principle remained something of a mystery throughout most of ancient human history. In 700 B.C., Assyrians used crystal to improve vision. Later, the Roman philosopher and dramatist, Seneca, would recount his use of water in a bowl as a magnification tool. It wasn’t until somewhere between 1000 and 1250 A.D. that a more precise tool called the “reading stone” was widely used. Reading stones were made of concave pieces of glass and are thought to have been widely used by monks who were one of the only literate societal classes at the time. Historians don’t know exactly who invented glasses because there are conflicting historical records. However, it is generally believed that the invention must have come from someone living in Pisa, Venice or Florence in the late 13th century. Several figures have been credited with the invention, including Salvino D’Armate of Florence and Alessandro della Spina. However, the epitaph claiming Salvino D’Armate as the inventor has since been proven a fraud, and Alessandro della Spina was likely just a vocal advocate of eyeglasses who wished to share the invention with others, not their original creator. These first glasses would likely look quite foreign to a person today. Their design was simple – two circle frames, quartz lenses and a bump to rest on the bridge of the nose – with no arms to anchor the spectacles firmly behind the ears. 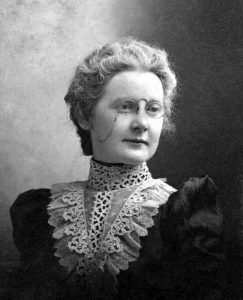 Soon after their invention, standardized manufacturing practices were put in place and the spectacles were marketed specifically for vision correction. Italy had a burgeoning glass industry, so they quickly became the forerunner in the spectacles business, exporting glasses throughout Europe. Historians are quite confident glasses were invented no later than this period, as they began appearing in artwork, such as Tommaso da Modena’s 1352 painting of Cardinal Hugo of Provence reading with a pair of spectacles. Modena must have taken some artistic liberties, as the Cardinal died before the invention of glasses, even by the most conservative estimates. Since their invention, glasses have undergone several revisions and reinventions. The earliest types tended to be rivet spectacles, which looked very much like two magnifying glasses affixed together by a rivet so that the “handles” rest on the bridge of the nose. These were then followed by pince-nez glasses that the wearer pinched to fit their nose, and then spectacles with handles like scissors-glasses and lorgnettes. All these early glasses were primarily for farsightedness (hyperopia) and aging-related vision loss (presbyopia). Glasses for nearsightedness (myopia) were not available until the 15th century. People use precariously balanced, handheld and handled glasses for several hundred years. Rigid temple pieces, otherwise known as the “arms” of the glasses, weren’t invented by Edward Scarlett until 1730! Before that, wearers had to settle for ribbons or chains to keep glasses steady on their heads. What’s even stranger? People didn’t go to their local eye doctor to get glasses until the 1800s, and the eye chart with the giant E at the top wasn’t invented by Herman Snellen until 1862. Before then, people bought their glasses from peddlers by trial and error, purchasing them more like a commodity than a medical device, much like we might buy a cheap pair of sunglasses today. Fortunately for us modern-day patients, we now have access to regular vision screenings and can choose from a wide variety of stylish or specialty frames. 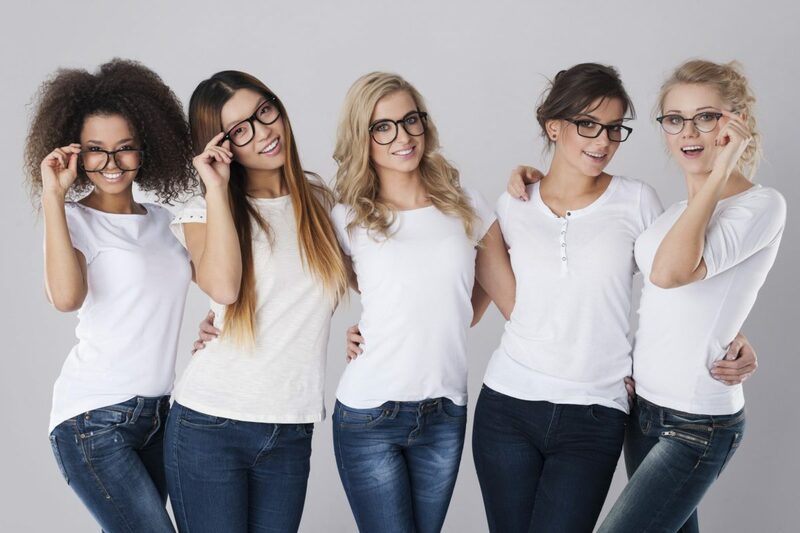 At Edina Eye Physicians, our experienced ophthalmologists will conduct an expert eye examination to determine if prescription lenses might be right for you. After choosing from our wide selection, we will help fit the glasses for you. All eyeglasses come with a one-year warranty covering lens scratches and frame manufacturing defects. If you’re looking for an annual exam, updated lens prescription or simply a style change, schedule an appointment online or call 952-832-8100 today!